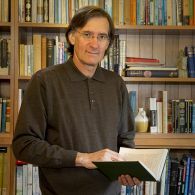 Jeff Malpas is Distinguished Professor at the University of Tasmania. A trained philosopher, but with a University-wide appointment, he supervises students across several disciplines including, geography, philosophy, architecture and the arts, also publishing across those same disciplines. His work is strongly grounded in post-Kantian thought, especially the hermeneutical and phenomenological traditions, although it also incorporates aspects of analytic philosophy, and is centred on the project of 'philosophical topography' – a mode of inter-disciplinary philosophical inquiry that takes place (or 'topos') as its key concept. He draws on the thinking of a diverse range of thinkers including Hannah Arendt, Albert Camus, Donald Davidson, Martin Heidegger, and Hans-Georg Gadamer. He is co-editor of the Springer series Contributions to Hermeneutics and the Journal for the Philosophy of History. He was the founder and the first Director of the University of Tasmania's Centre for Applied Philosophy and Ethics (now the Inglis Clark Centre), and has many years' experience in consultancy and training for both Government and private sector organizations. He is the author or editor of some 20 books, and has published over 100 articles in scholarly books and journals. Prof Malpas has served as an expert advisor to the Australian Research Council and the European Research Council. He is also is a past President of the Australasian Association of Philosophy, and served for some years on the Association's Council. He is Vice-President of the Australasian Association of von Humboldt Fellows. He is an Associate of the International Institute for Hermeneutics. Corresponding Editor of the International Journal of Philosophical Studies. Prof Malpas is a member of the Editorial Boards of the following journals: , Études Phénoménologiques / Phenomenological Studies; Architext: Journal of the School of Architecture, Ariel University, Israel; Montreal Architectural Review, University of Montreal; Member, Editorial Board, Encyclopedia of Global Bioethics; Annals in Social Responsibility; Journal of Island Studies; Interstices: Journal of Architecture and Related Arts; International Journal of Philosophical Studies; Ethics, Policy and Environment; Tropos. Rivista di ermeneutica e critica filosofica; and the publishing house Mimesis. At the University of Tasmania, Prof Malpas has been: Director of the University Theme Area, 'Community, Place and Change'; Director of the Buddhist Studies in India Exchange Program; Director of the Centre for Applied Philosophy and Ethics; Head of the School of Philosophy; and a member of the University Planning and Resources Committee. At Murdoch University he was: Chair of the Human Research Ethics Committee; Research Manager and Chair of the School of Humanities Research Committee; Chair and Founder of the Philosophy Programme; and Section Head of the Politics, Philosophy and Sociology Section. Prof Malpas holds a research position, but has previously taught across all areas of philosophy from ethics to logic, as well as in areas of architecture and geography. He still teaches on an occasional basis. He has also led workshops and given seminars in non-academic contexts to government, business and other groups. Prof Malpas' work is cited in courses on twentieth-century German philosophy, on philosophy of language and hermeneutics, on place and space, on philosophical methodology (especially ideas of the transcendental). He does not teach on a regular basis, but has extensive experience in teaching across a wide range of areas. Visiting Professor, Department of Philosophy, Uppsala University, Uppsala, Sweden, October-November, 1997. Over the last five years Prof Malpas has presented invited papers to many university audiences around the world in places including Brazil, Peru, Argentina, Germany, Italy, Ireland, Switzerland, Greece, Korea, and Japan, as well as in Australia, the United Kingdom and the United States. Within philosophy, Prof Malpas is perhaps best known as one of a small number of philosophers who work across the analytic-continental divide, publishing one of the first books that drew attention to convergences in the thinking of the key twentieth century American philosopher Donald Davidson and the phenomenological and hermeneutic traditions, as exemplified in the work of Heidegger and Gadamer. More broadly, Professor Malpas' work has been characterized by considerable inter-disciplinary engagement, particularly in relation to issues of space and place and he is known as one of the very few philosophers working in this area, and as the author of a distinctive position in the field..
Prof Malpas' current research interests centre on issues of place, including space and place, time and place, memory and place, identity and place, place and community, place and language. He also works on hermeneutics, phenomenology, twentieth-century German thought, American pragmatist thinking, and ethics. Prof Malpas' work has involved the articulation of the concept of place in close connection with ideas of self and the human, as well as with ideas of the ethical and the political. It has arisen alongside the increasing focus on place across the Humanities, Arts and Social Sciences and has contributed to that developing focus. He is one of the few thinkers whose work looks both to the way place functions as a substantive focus of inquiry and as a guide to the methodology of inquiry. The 'philosophical topography' that lies at the centre of his thinking not only involves taking place, topos, as a key concept, but also entails a transformed concept of philosophy itself. As human being is 'topographical', so too is philosophy – thinking, no less than being, is always 'placed'. Much of prof Malpas' work has involved a dialogue with key thinkers from the phenomenological and hermeneutic traditions, and so has equally been significant for the light it has shed on those thinkers. His own 'topological' reading of Heidegger is now seen as a distinctive position within the Heidegger literature that stands apart from, and to some extent in competition with, the other approaches. The focus on place underlies Prof Malpas' work in other areas giving rise to a distinctive approach to ethics that also has consequences for thinking about contemporary culture and society. Prof Malpas has been deeply critical of the rise of corporatized, bureaucratic models within public life and public institutions and of the seeming loss of genuine ethical commitment across much of contemporary society. His claim is that 'ethics' has too often been replaced by an ideology of compliance that is itself corrosive of real ethical conduct. Against this, Prof Malpas argues for a view of ethics as grounded in our prior commitment to the communities, and so also to the places, in which we find ourselves, and as an essentially critical and self-reflective critical practice. Prof Malpas's work is highly collaborative. In 2015, for example, he participated in a major interdisciplinary event in Eichstatt Germany that drew together the key researchers on place with key researchers on situated cognition to explore connections between these areas. He is currently involved in editing the Routledge Companion to Philosophical Hermeneutics and was also the Co-Chair for the Philosophical Hermeneutics stream at the 2013 World Congress of Philosophy in Athens. Jeff is joint editor (with Claude Romano of the Sorbonne, Paris) of the Springer series Contributions to Hermeneutics. He is currently joint editor of the Journal of the Philosophy of History, and also serves on the Editorial Boards of several international journals. unexpected areas and ways - for instance: in local government in relation to issues of local and community identity; in nursing in the understanding of interactions with patients; among artists looking for new ways to conceptualize their work (he was a consultant for Arts Tasmania in 2014 as part of an NBN programme for emerging local artists); and by architects and planners looking to rethink modes of engagement with the built environment. Prof Malpas is currently working on a wide range of topics and projects including: the ethics of place, the failing character of governance, the materiality of memory, the topological character of hermeneutics, the place of art, and the relation between place, boundary, and surface.Jeff has been a keynote speaker at conferences in Sydney (Heidegger and the Aesthetics of Dwelling, University of Sydney, 2005), Hong Kong (New Heritage, University of Hong Kong, 2006), Hobart (Australasian Association of Career Counsellors National Conference, 2008, and National Public Administration Conference, 2011), Melbourne (AAP Annual Conference, Melbourne University, 2009; Time, Transcendence, and Performance, Monash University, 2009; International Animation Conference, RMIT, 2012; Flow 2: Landscape Architecture and Design, Melbourne University, 2012), Patras, Greece (The Significance of Philosophy in Architectural Education, University of Patras, 2009), Stockholm (Nordic Society for Phenomenology, Sødertorn University, 2010), Busan, South Korea (Busan National University, 2011), Rio de Janeiro and Buenos Aires (Phenomenology and the Transcendental, 2012), Copenhagen (International Phenomenology Summer School, University of Copenhagen, 2013). All of Prof Malpas' monographs and edited volumes, throughout his career, have been published with highly reputable and prestigious presses–Cambridge, MIT, Chicago, Springer, and Routledge. The fact that his work is now increasingly being made available in translation (from Italian to Korean) is additional evidence of its impact and influence. Whether for journals or edited volumes, almost all of the essays Prof Malpas has published over recent years have been invited submissions, and as a result he has published in a wide range of journals and volumes, and often in non-English-speaking publications. Since 2000 Prof Malpas has been involved in four successful ARC Discovery grant applications (including an APF), two ARC Industry Linkage Grant applications, and one ARC Linkage International Fellowship application. Contemporary architecture is increasingly dominated by digital and parametric approaches that are essentially quantitative in character. Yet there is also a widespread assumption that architectural design ought to be essentially oriented to questions of place. The question arises: can place be adequately encompassed by the quantitative methods of digital and parametric design? The aim of the project is to explore this question with the objective of clarifying the nature of place and of parametricism, as well as enabling a rethinking of what design itself might be. The project will operate through a set of studio provocations based in the fictional places of Mervyn Peake's Gormenghast novels. Combining historical and conceptual approaches, this project aims to develop a new philosophical anthropologythat centers on understanding human being in terms of both place and commonality. This account will provide thebasis for a rethought conception of the ethical that is bound to human life and that understands the ethical asessentially a matter of judgment rather than prescriptive rule. Prof Malpas has supervised and examined students in art, architecture, agricultural science, cultural studies, education, film theory, geography, literature, philosophy, sociology. He is particularly interested in work that connects directly with his own research interests, but is happy to consider any work that is interesting and innovative in its own right. Perhaps the only area in philosophy in which he has not supervised or examined is in formal logic.